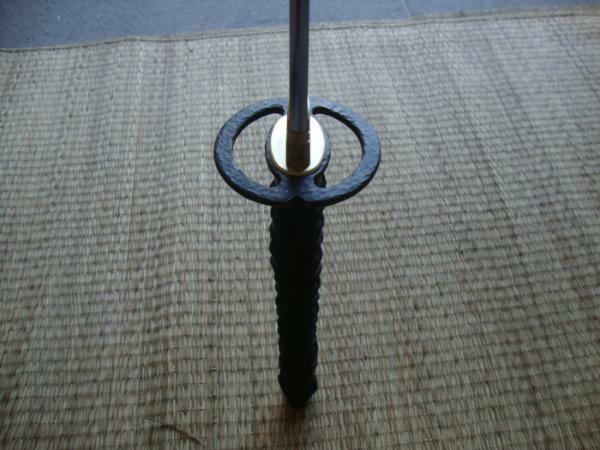 Introducing model Twelve from the Dojo Pro bo-hi series, this particular design has a classic double C ring style tsuba whose design is attributed to the legendary Sword saint Miyamoto Musashi. 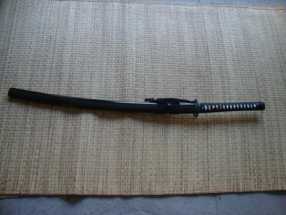 First and foremost, this katana is really a steal for the price. However, there are things to look out for (I'm really just nitpicking here). Firstly, when I placed my order, I thought the saya, sageo, and the ito are dark blue, but they turn out to be purely black. This may have just been a monitor color problem, so it's not SBG's fault. Secondly, the mouth of the saya could be a bit tighter, as my katana slips relatively easily out of the saya (yes, I pushed it all the way into the saya to "lock" it, but all that it takes is a gentle shake and the katana will slip out of the saya). 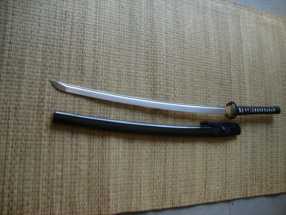 Having said that though, the gentle shake "test" is when I hold the saya + katana upside down and hold onto just the saya. This is to say that the weight of the katana and my gentle shake are the only forces that act against the "lock" of the saya. I personally would've liked the "lock" to be a bit tighter, but that's just personal opinion (plus, who actually holds their katana by the saya and upside down anyways?). Lastly, when I try to paper-cutting test, I find that only the first third of the katana (from kisaki to the third) is able to perfectly and consistently cut the paper (from edge of paper). The rest of the blade is really inconsistent in doing so, especially the middle third of the blade. Don't get me wrong, the entire blade is sharp and will be able to cut through a lot of things, but when it comes to delicate cuts like cutting paper freehand, only the first third is consistently capable of doing so. In defence of the lack of sharpness in the latter two thirds, it is still sharp enough to cut my thumb when I accidentally pressed onto it (stupid mistake, don't ask). Plus, this is a simple fix of just sharpening up the sword a little more to achieve your desired sharpness. These are the only three things that really bothered me. There are SUPER little minor things that I could list here, but it would be unfair to judge those points due to the price of this sword (e.g. quality of sageo, tsuka-ito diamonds are a tad uneven, etc). Plus, these things are really cheap to replace, and may even need to be replaced in the future due to natural wear and tear anyways. As for the common concern about the waxy residue present on the blade with every draw, I have not owned this katana long enough to comment on its persistence, but as of now, I still get the waxy residue with every draw (it's been two days of nightly practice of drawing and sheathing (noto)). That's enough of the cons. Now for some pros of this katana. 1) Super sharp! 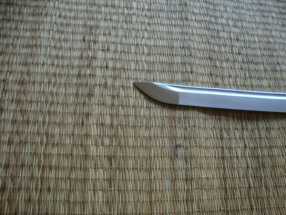 Just looking down the ha (cutting edge of the blade) of the katana, you can see how sharp it is. 4) The tsuba allows easy threading of the sageo to tie a safety knot when needed. 5) Balance of the sword is nearly perfect. I feel like I can control the speed of the sword at my will (given I practice with it for a little longer). At least, I don't feel like I can't stop the blade once I swing it. 6) There was not a single scuff or scratch on my blade when I received it. I was really pleased with this, as many others found a few scuffs on theirs. Overall, I believe this is truly a bang for the buck katana. The only reasons I gave it 4 stars instead of 5 is mainly for the "dullness" of the middle portions of the blade (but, again, it's still really sharp, just not paper-cutting sharp). 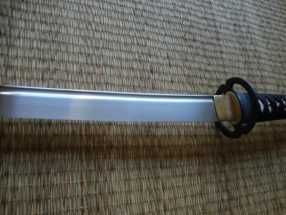 This katana is a relatively skinnier blade than others, but this, in my opinion, just improves its agility. 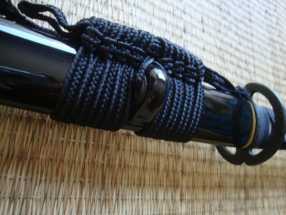 The bottom line is that I would definitely buy another Ronin Katana from SBG in the future.